Aimed at working players at all levels, the price is still affordable and makes the new amp very competitive. There’s very little to moan about. Fast forward to today and it’s time for another update: three models from the new Mk IV range: the HR Blues Deluxe IV, the HR Blues DeVille IV, and a limited edition of the Pro Junior IV. Today, we’re looking closely at the DeVille. Both larger Hot Rod IV combos feature the same familiar cabinet design as their predecessors, which was in turn based on the legendary narrow panel ‘tweed’ amplifiers of the mid-to-late 50s. One change that isn’t immediately visible is a different construction material; from MDF and plywood back to the solid pine used on the 50s originals, which provides a significant weight reduction as well as improving the cabinet’s resonant properties. The black control panel has a slightly different textured finish, with more visible graphics and ivory chicken head knobs, which don’t quite match the lettering - a very tiny annoyance that could easily be tweaked with a different shade of paint. There’s also a new ‘lightly aged’ variation on the familiar sparkle grille cloth, which blends nicely with the black textured vinyl covering. Both of the big combos feature a new loudspeaker, the very popular Celestion ‘A-Type’, with a single 12-inch driver in the HR Deluxe and a pair in the slightly bigger cabinet of the DeVille. Behind the rear panels of all three amps, the electronics sit in robust open-ended steel tray chassis, which are secured to the cabinet top and sides with substantial mushroom-head machine screws. The layout for all three amps is more or less the same: a large vertical single-sided PCB holding most of the small components including the panel knobs and switches, linked by ribbon cables to a more robust through-plated board sat horizontally in the bottom of the chassis, which holds the valve bases. Fender has stuck with this type of layout from the beginning and while it’s more than adequate, we’d be happier with through-plating on both boards and stranded hook-up wire replacing those ribbon connectors. Nevertheless, the build standard on all three amps will certainly stand up to long-term use. early 1960s. Although the DeVille and Deluxe share the same valves, the DeVille has a beefier output stage which produces 60 watts compared to the 40 watts of the HR Deluxe and of course there’s an extra loudspeaker, substantially raising the volume levels. The two larger combos have identical controls, just like blackface amps of the 1960s, where the output stage and speakers differed, but front panel features remained the same. There are two input jacks with high and low sensitivity, to match to the widest range of guitars. These feed footswitchable normal and drive channels, which share the familiar three-band EQ that Fender introduced on the 1950s tweed Bassman. The normal channel has a single volume control and a bright switch for adding extra snap to mid-heavy humbuckers, while the drive channel has a preamp gain and master volume together with a ‘More Drive’ switch, which adds a large dose of extra gain. This function is also footswitchable, giving the amps effective three-channel operation. A pair of preamp out/power amp in jacks on the top panel make it easy to connect effects pedalboards or connect multiple amps together; the third jack is for the supplied footswitch, which toggles the channels and the Drive/More Drive mode. There’s a pair of main and extension speaker jacks on the underside of the chassis and not much else. The Pro Junior’s back-to-basics panel features a single input jack, feeding volume and tone controls. There’s no effects loop or channel switching; it’s a very simple design, with an emphasis on the most direct signal path between input jack and loudspeaker. Overall, this amp looks the business, with classic cabinet dimensions and styling inspired by Fender’s rich history. The DeVille amps sit squarely in Fender’s sonic home turf, with a rich clarity from the Normal channel that’s roughly halfway between the polite, slightly scooped mids of 60s blackface and the feistier midrange of 50s tweed, featuring a sweet, sparkling treble and tight bass response that emphasises low-end punch. The Drive channel adds plenty of tweed-inspired crunch, great for blues and classic rock stuff while activating ‘More Drive’ kicks things up another notch for a smooth and fluid sustain. The drive channel circuitry has been slightly tweaked to improve note definition and while it’s a subtle change, you can hear more attack as you hit the strings harder. There’s no particular preference for single coils or humbuckers; we used both amps with a variety of guitars including Les Pauls and Strats and they were all easy to dial in. The traditional spring reverb circuit on the DeVille has been re-worked for a smoother sound and is a noticeable step up from previous models, surrounding notes with a halo of warm, mostly crash-free delay, although you can hear that it’s still a spring, especially as you turn up the level. 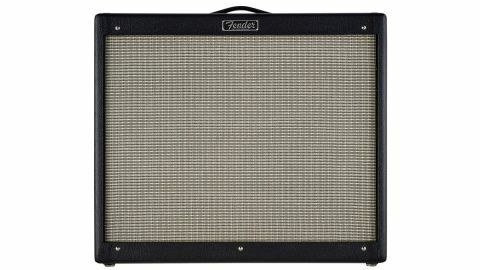 Modern digital reverbs have improved to the point where they’re sonically superior, not to mention being electrically quieter and more robust; however, it’s good to see Fender keeping the spring tradition alive. The DeVille IV has plenty of volume for live work: if you need more clean headroom or use pedals then the extra headroom of the De Ville IV’s 60 watts and twin loudspeakers is worth paying for. years and these latest versions continue along the same lines; carefully-considered tweaks here and there advance them, without drastically changing the formula we’ve come to know and love. The reduced weight and improved resonance of a real pine cabinet is probably the best thing about the bigger Mark IV amps.